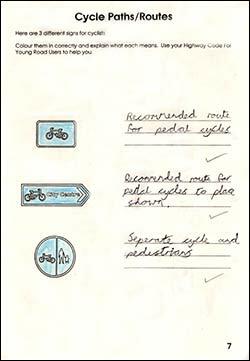 One of the most useful extra activities for children at Whitefriars Junior School was the Safe Cycle Training - Cycling Proficiency as it used to be called. Children had to take their bikes into school where they were checked to ensure they were all in order before having practical training in how to ride safely on the roads. This was done on the playground at the school. 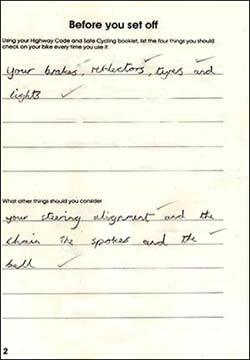 The children also had to complete a work book, which is reproduced here. 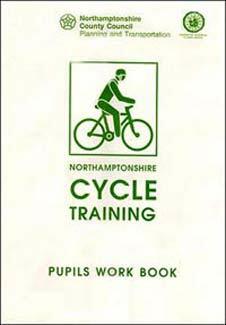 Hello, welcome to the Northamptonshire County Council Cycle Training Scheme. In this book you will find questions all about safe cycling. 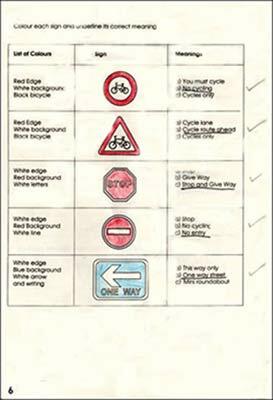 If you do not know the answers, your Highway Code For Young Road Users and Safe Cycling booklet will help you. If you are unsure about anything ask your teacher or instructor. 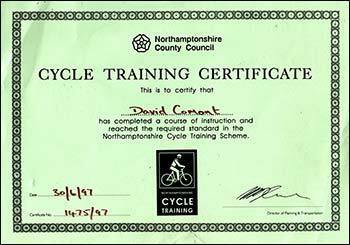 When you have finished the course, it is just the start of your safe cycling career. You will have some knowledge but it is important to increase this and develop your practical skills. Your safety is up to you  learn all you can now and always use it. Do not be tempted to do what you know is wrong. Always be considerate to other road users and watch out for the mistakes they make which might put you in danger. 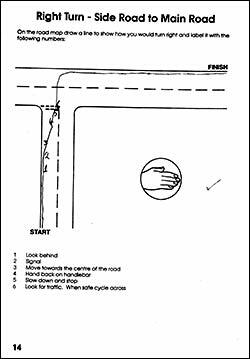 Q Using your Highway Code and Safe Cycling Booklet, list the four things you should check on your bike every time you use it? Q What other things should you consider? Q Some animals use camouflage to protect themselves, others use camouflage to help them hunt. Can you name any? 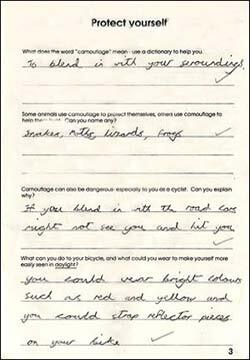 Q Camouflage can be dangerous, especially to you as a cyclist. Can you explain why? A If you blend in with the road, cars might not see you and hit you. Q What can you do to your bicycle, and what could you wear to make yourself more easily seen in daylight? 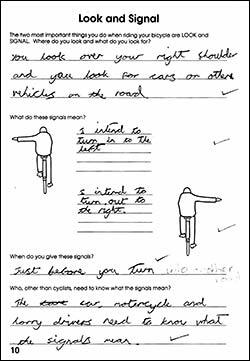 Q What can cyclists do to make themselves more easily seen at night? Q More than half of reported injuries in cycling accidents are to the head. How can a cyclist protect their head from injuries? Q Does wearing a cycle helmet stop accidents happening? 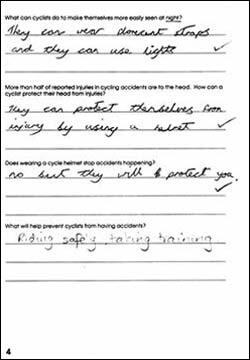 Q What will help prevent cyclists from having accidents? Colour them in correctly and explain what each means. 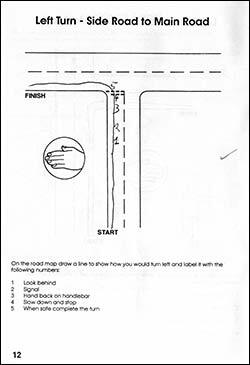 Use your Highway Code For Young Road Users to help you. 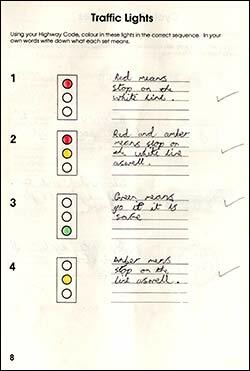 Using your Highway Code, colour in these lights in the correct sequence. In your own words write down what each set means. 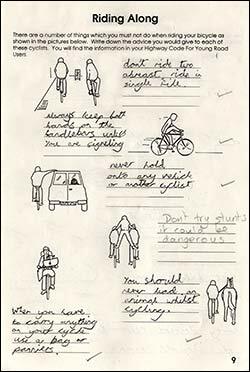 There are a number of things which you must not do when riding your bicycle as shown in the pictures below. Write down the advice you would give to each of these cyclists. 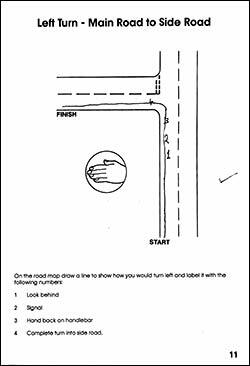 You will find the information in your Highway Code for Young Road Users. 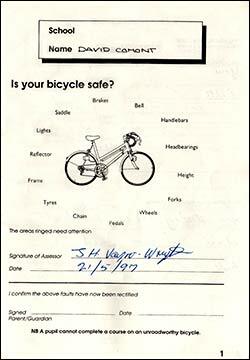 The two most important things you do when riding your bicycle are LOOK and SIGNAL. Q Where do you look and what do you look for? A You look over your right shoulder and you look for cars or other vehicles on the road. Q What do these signals mean? Q When do you give these signals? 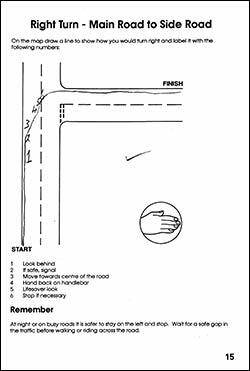 Q Who, other than other cyclists, need to know what these signals mean? 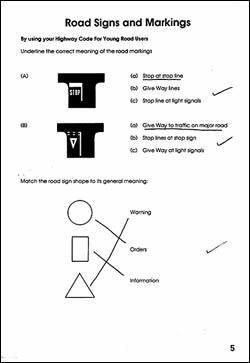 A The car, motorcycle and lorry drivers need to know what the signals mean. At night or on busy roads it is safer to stay on the left and stop. 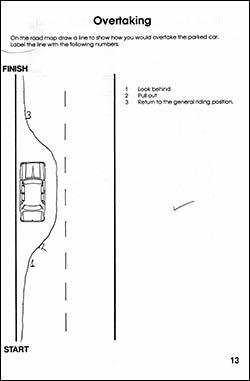 Wait for a safe gap in the traffic before walking or riding across the road. 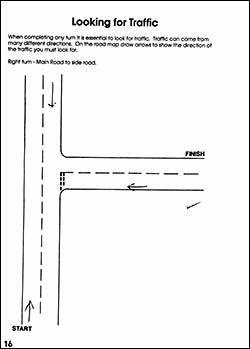 When completing any turn it is essential to look for traffic. Traffic can come from many different directions. On the road map draw arrows to show the directions of the traffic you must look for.